Most of us understand agency to mean a kind of company: one that represents other companies, or individuals. Insurance, real estate and advertising agencies come to mind. In fact agency has a deeper and more important meaning. Namely, the capacity of individuals to act independently, to make choices, and to impose their will in the world. By this meaning, agency is a big deal in sociology, psychology, philosophy, law and many other fields. But it’s missing is business. That’s because we’re accustomed to understanding business as a structural thing: an instrument of control. The debate concerning the primacy of either structure or agency on human behaviour is a central ontological issue in sociology, political science, and the other social sciences. In this context, “agency” refers to the capacity of individuals to act independently and to make their own free choices. “Structure“, by contrast, refers to the recurrent patterned arrangements which seem to influence or limit the choices and opportunities that individuals possess. The structure versus agency debate may therefore be understood simply as the issue of socialisation against autonomy. Limiting individual choices through “patterned arrangements” has been an ideal of big business for a very long time. Choice is an ideal too, provided your product or service provides a choice for customers to not choose competing products or services. Agency-type choice, in which individuals are free to assert their will and their means, doesn’t get much respect. In fact, most big businesses aren’t interested in customers that have lots of agency — unless those customers aren’t captured yet. Instead big business has long idealized controlling customers. That’s why they talk about “capturing,” “acquiring,” “managing,” “locking in” and “owning” them. And spend billions on systems that help them do that. Personal autonomy on Facebook only goes as far as Facebook lets it go. Same with every other “social” system run by an entity other than yourself. They put a lid on your agency. You are not free. I’m not saying there’s anything wrong with social systems, or structures, or even with businesses that want to control your choices. I am saying that agency has been AWOL from the market’s table. And bringing it there is what we’re doing with VRM. What we’ll have, as VRM tools roll out and come into use, is many ways to test concepts such as methodological individualism and action theory. Mostly, however, I think it’s a way to see how much larger, and better, we can make the economy once individual customers are free to express their intentions. Bonus link — which I put here hoping that somebody can fix it. Since it’s about me and some stuff I’ve said, I’m not the one to do that. A year ago, at VRooM Boston 2009, Ben Rubin, founder and CTO of Zeo — the hot new sleep fitness company — visited questions about who owns and controlled personal data. 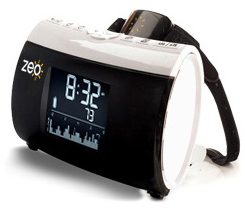 Was the sleep data you produce as a customer entirely Zeo’s? Was it yours? Both? Neither? What right should anybody have to use it, and under what conditions? These kinds of questions aren’t easily answered at a time when mining and selling personal data has turned into a white-hot industry, whether people like it or not. Data about individuals is also easy to rationalize as a corporate asset: something that makes the company itself more valuable. Since then answers have begun to sort themselves out. I opened Zeo up, soldered to the lines that drive the display, and got my sleep phase output to my PC in real-time! This generated substantial interest from Zeo – and Ben Rubin (Zeo CTO) and I began our discussion on hacking, open source, and Zeo. I was thrilled when I learned that part of my summer would be interning for Zeo creating official ways to get at Zeo data! Remember everyone’s favorite Zeo-hacker-turned-intern, Brian? This summer, Brian produced two amazing projects for Zeo: the first – the Zeo Data Decoder – allows you to get at your sleep data without uploading it. The second (the main course, if you will) is the Zeo Raw Data Library. We hope developers will use the Raw Data Library for cool applications. Need some ideas? Build a lucid dreaming application that triggers a light or sound when a user enters REM sleep. Wake yourself during REM in the middle of the night and keep a sweet sleep journal. Use brainwaves for cool Brain Computer Interface projects while you are awake. For inspiration check out interAxon. Visualize your brainwaves while awake for bio-feedback applications like concentration or relaxation. How do I get my hands on it?!? You can get the documentation, the library to read the RDL, and an example sleep stage and brainwave visualizer over on sourceforge. Yup; we decided to open source all of that stuff, so feel free to hack/modify to your needs (and share if you like!). The special firmware (2.6.3R) needed to run the RDL is over here after you fill out a simple form. We encourage people who are using the RDL to jump on the forums and discuss it. People are already using the RDL to optimize polyphasic sleep naps and help them lucid dream with Zeo. Please use the forums for support and also feel free to email us at DeveloperRelations@myZeo.com. We’ll also do our best to help troubleshoot, but remember that this is an alpha release so there may be bugs. Please let us know what you think in the comments on on the forums. Hack away! I just had to post that whole passage because it’s so completely cool. Zeo is proud to announce the first partner using ZQ outside of our own web application: The Digifit Dashboard for Healthy LivingSM iPhone app. Digifit is the only Healthcare and Fitness app for the iPhone that integrates heart rate monitoring for tracking cardio fitness. We’re pretty sure Columbus from Zombieland would be happy with this — his #1 Rule for a Zombified America is Cardio! Withings and Zeo are leading edge pioneers in the industry and we are thrilled to partner with them. With the latest upgrade, our Digifit app completes the health triad puzzle by ‘automagically’ tracking the three most important influences on one’s health: exercise, weight and sleep. We do indeed have it All Together Now. This is close to home for me, because I’m just starting to get into serious fitness work, which started with my Withings scale. Gotta get a Zeo thing now. (Like the one above.) And Digifit. Digifit is the first partner to leverage our soon-to-be-released Web API, which allows data from Zeo to flow out to any internet connected service that wants to leverage the power of sleep quality. We’ll continue to partner with organizations working in athletics, nutrition, general health, and more to help their users leverage the power of sleep fully so stay tuned! For more on API jazz, follow Craig Burton. I especially like his Prezi here. Gets you thinking about bi-directional or “full duplex” APIs. This tutorial shows how to do context automation with Kynetx KRL webhooks and the Twilio API.